There were several Civil War era flags authentic to each side used during the Civil War. The flags helped to identify the state, militia, and even whether the troops were Union or Confederate. 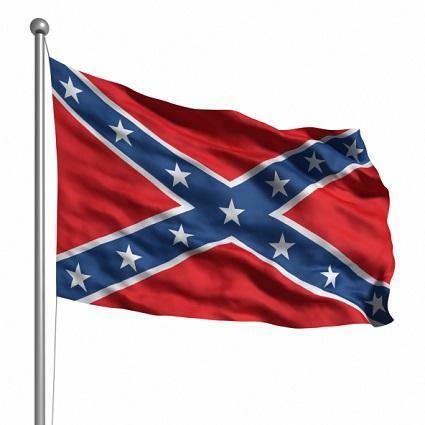 The Stars and Bars was the first flag of the Confederacy. It was purposely designed to look like the U.S. flag but it caused confusion on the battlefield because of its similarity. Stars and Bars started out with only seven stars on it but eventually ended up with thirteen. Stainless Banner was the second national flag of the Confederacy. It was created by an Act of the Congress of the Confederate States and made by the Richmond Clothing Depot. The flag had a white field with a red square in the upper left corner on top of which was a blue cross decorated with thirteen stars. Third National was the third flag of the Confederacy. It was decided that Stainless Banner should be modified to include a red bar on the right side so that it would not be mistaken for a truce flag. Bonnie Blue was an all blue flag with a single white star in the middle. It marked the secession of the state of Mississippi. Naval flags were flown by Confederate war ships while they were in port. There were several versions of the Naval Jack. General Lee's Headquarters flag, like the name implies, was used to mark the General's headquarters wherever they were. The original is in the Museum of the Confederacy in Richmond, Virginia. It had a thick white horizontal stripe flanked by two red stripes of the same size. In the left corner there was a blue square with thirteen white stars on it. Post war, Confederate flags are seen as controversial. Some people feel they are simply a matter of Southern pride while others see them as symbols of racism and hate. 33 Star U.S. was the American flag with a thirty-third star added for Oregon. The Fort Sumter flag flew over Fort Sumter during the Confederate bombardment in April of 1861. It was similar to the 33 Star flag although the stars were arranged in a different order. As the names imply, the 34 Star U.S. and 35 Star U.S. added stars for Kansas and West Virginia, respectively. General Custer's Headquarters flag was made by the generals' wife and flew over his headquarters. The original was lost during a battle. The flag was half blue and half white and had two crossed white swords on it. General Sheridan's Headquarters flag was a flag made for a prominent general. Sheridan headed the cavalry of the Army of the Potomac. Supposedly he had more than one flag. 2nd Tennessee Infantry, 4th U.S. Infantry and 144th Regiment, New York Volunteers flags were flags designed for specific military groups. Illinois Regimental Civil War Flags were carried by Illinois soldiers during some very significant Civil War battles. Supposedly they were returned to the state at the end of the war and are housed in Springfield, the state capitol. Civil War and American flag buffs can collect replicas and small framed flags from places such as Historical Americana. Ebay and antique stores are also good places to find authentic Civil War items. Keep in mind however, that there are many collectors competing for a few authentic flags. This means the prices can be very high and the supply is very low. It can be meaningful to collect Civil War era flags. Authentic flags in good condition command high prices and must be stored carefully. Replica flags are affordable and can be used in re-enactments and other situations. Use the appropriate flag for the appropriate activity to ensure that these pieces of history are available for future generations.